Matt and Anna are a reasonably happy couple. One day some masked men break into their apartment and tell him if he doesn't follow their instructions Anna will die. This sets Matt off on a wild chase across London as he tries to complete various tasks and beat various obstacles. 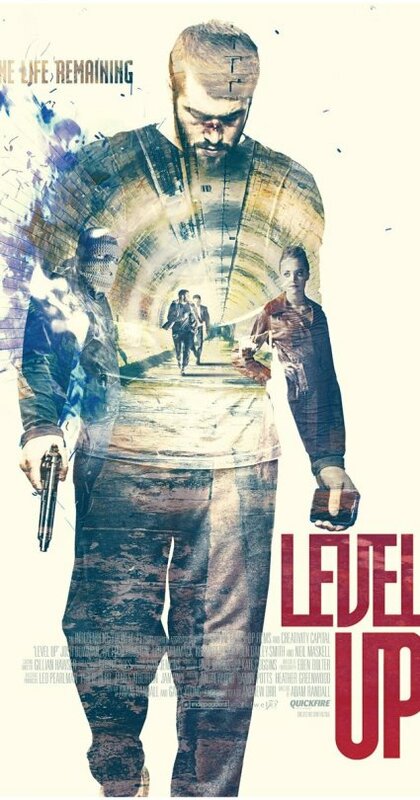 Good B level thriller is doomed to get lost until a few years down the road when it's certainly going to be rediscovered since LEVEL UP is coming in the middle of Hollywood's larger budget versions of the same thing (NERVE anyone?). Sadly there have been too many variations of "the mysterious group demands our hero or heroine complete tasks which are filmed" over the last couple of years (and weeks) with the result is that on the face of it there really isn't anything new here. I know saying that is a shame but it's the truth and watching the film I found that my interest was flagging, not because it's a bad film, it's not, rather it's simply that I've been here way too many times of late. Had I not seen several variations of this in the last few months I would have been over the moon. Distancing because its coming in the middle of a cinematic clump aside this is one of the better variations on the the theme. A great cast sells some solid action sequences, a fact which is always good news. Also good news is that the lack of budget has resulted in a script with real characters. I don't know when I saw a film like this where I actually thought of the characters as people and not pawns to be moved about. Its a good enough film that I suspect that don the road the film will end up being one of those films that people discover on their own and start talking about until the films fortunes turn around and a cult is born.